I'm a yarn entrepreneur who loves a challenge! Always thinking of innovative ways to promote fiber arts and handcrafting. Raise your hand if, at the beginning of each year you have great intentions of creating amazing hand-knit gifts for everyone you know. Now keep your hand up if, by around October, you find yourself frantically searching Ravelry for quick, chunky hat patterns. Yeah, me too. So, at the end of 2016 I decided to see if I could devise a plan to map out my knitting for the next year. I emailed all of my family to see if there were any hand-knit gifts they would like and I created a system for determining the number of hours available to knit per month. Then I computed the number of hours it would take to knit each project to determine my ability to complete them all. If you're guessing that my plan fell apart sometime around July, you would be correct. But my husband, God love him, was quite amused by the bag of sweater yarn and the half-knit pair of socks he got for Christmas. I guess I should tell you that I didn't do this all on my own. Oh no, I decided that I needed to share my brilliant plan with the Knitizens of my shop to see how many of them I could coerce into joining in on the fun! So I called the program Harps & Thistles Yarn Emporium Gift-A-Long, created a Facebook page for sharing information and distributed the materials that were sure to keep everyone on track. And I have to admit that there were a few successes... OK, one. But that was enough to give me encouragement that, with just a little tweaking, I might actually come up with something useful. New & Improved Gift-A-Long 2018 - Thank You Ravelry! Why did I fail last year? Unexpected projects? Yes! 2 baby gifts + 2 prayer shawls + lots of shop samples. A little bit of attention deficite? Well, who can resist casting on that new 'Hot Right Now' project that everyone is raving about? So this year's plan is to STAY FOCUSED! And also make allowances for some of the above derailings and distractions. 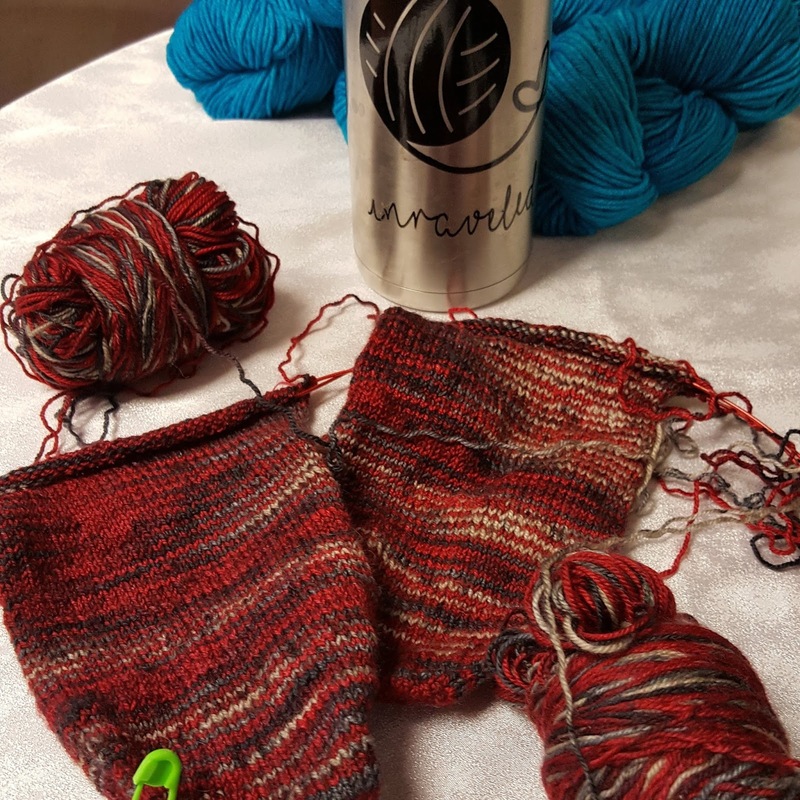 Plus, have you seen Ravelry's 2018 Project Challenge? We were made for each other! To start you simply type in the number of projects that you want to complete this year. No pressure! You can go back and change it if you need to. This page is fed by your queue so now is where you start adding items that you want to knit and prioritizing them. Again, you can change them around or delete them, nothing is written in stone! Just be sure you enter a deadline for completion of the project because that's what adds it to the Project Challenge page. HINT: If you add a deadline to something that you're already working on, it will be added to your challenge as well. This sounds a little bit like cheating, but I'm OK with that. Once you have them entered you simply click back into 'challenge' to find your queue all organized by the deadline date. Then, when you mark that you've cast a project on, it will move from your queue to your 'projects' page and move up to WIP's on the 'challenge' page. The remainder of your queue will be at the bottom of the page in the 'Plans' section. Let me know how you're doing with it and if you're so inclined, join our Facebook Group so we can see how you're doing! And feel free to email me if you have any question. If you live locally, you can always sign up for one of our Ravelry Classes online! In the meantime, I need to get going. Those 20 projects aren't going to knit themselves! My love and passion for fiber, color and creativity has led me down this path of wonderment. This industry includes some of the most remarkably talented people who contribute to its ever-changing evolution. Fiber work is truly an art and I promote it as such. Whether it’s creating incredible colors in a dyeing studio, designing the next fashion statement or performing magic with needles and hooks to create a unique masterpiece, there’s always something to learn and be inspired by. It’s ever changing and always exciting!